Fuguecoin (FC) is a new alternative crypto currency using a new Fugue256 algorithm that launched yesterday as a CPU only coin and there is already a GPU miner available. 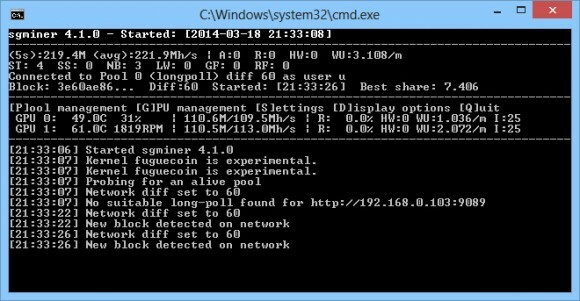 If you want to give the coin a go and try the sph-sgminer with support for Fuguecoin we have compiled a windows binary that you can download and use (source). The coin is with uncertain future now that it is no longer a CPU only coin, though there is only one pool that apparently has some issues (we could not connect to it), so you will have to try and solo mine with the wallet. Also there are still no exchanges for this new crypto, so it is up to you to decide if you should give it some time or no… we are not going to. Below you can download the modified version of sgminer with Fuguecoin support for mining on GPU under Windows.